Brisbane-born Maurice Christopher Wood – the clerk of petty sessions in the country town of Kingaroy and a keen gymnast and athlete - enlisted in the 1st AIF in January 1916. He went on to serve in Belgium and France as a Lieutenant with the 41st Australian Infantry Battalion. Post-war Maurice returned to the public service, pursuing a career in the taxation area of the Queensland Treasury and later that of the Commonwealth. He retired from the role of Assistant Deputy Commissioner (Administration) in the Queensland State Headquarters of the Australian Taxation Office (ATO) in 1956. The youngest of his brothers – Cyril Norman – also served in the 1st AIF, in the 5th Australian Light Horse Regiment and is listed on the Honour Boards. Maurice was born in Bradley Street, Spring Hill, Brisbane on 24 January 1892, the third of four sons of Charles Frederick and Ellen Elizabeth (née Dodwell) Wood. Late January was often an eventful time in his life – in that part of the month he was born (24th), commenced in the public service (23rd), enlisted in the 1st AIF (25th) and died (21st). Both his parents were English-born, and had married in St Mary’s Church, Kangaroo Point, Brisbane in January 1886. At that point Charles was a farmer at Tingalpa - later he owned and operated a steam laundry. The family of six lived in Amersham on the corner of Bradley Street and Gregory Terrace, Spring Hill, and were in the congregation of Saint Andrew’s Presbyterian Church (on the corner of Ann and Creek Streets in Brisbane), with Charles serving on the Board of Management. The two eldest brothers – Charles Theodore and Jack Stephenson – attended the Leichhardt Street State School, won State Scholarships and attended the Brisbane Grammar School. Despite a hearing impairment, Theo worked as a journalist, qualified as a barrister and had a career with the Queensland Parliamentary Reporting Service, rising to be the Chief Reporter 1933-1954. Jack pursued a career as an accountant. In family circles Maurice was called ‘Paddy’ because he had something of a temper, said to be a result of having to stand up to two older brothers. Apparently not as committed as his two older brothers to academic achievement, and more interested in sports including gymnastics with the Young Men’s Christian Association, Maurice attended the Leichhardt Street School, passed the Queensland public service examination and commenced on 23 January 1907 as a messenger in the Home Secretary’s Department. When Maurice enlisted in January 1916 he was aged 24, 5’5” tall (167 cms), with brown eyes and hair, a medium complexion, and weighed 133 lbs (60.3 kg). He had been a 2nd Lieutenant in the 8th Infantry of the Citizen Military Forces for two years and in the 1st AIF was initially made a Sergeant. He applied for a Commission on 24 April 1916 and after four weeks of officer training at the Royal Military College, Duntroon, was promoted to 2nd Lieutenant on 16 June 1916. One month later Maurice married Townsville-born Eileen Sydney Burrell, daughter of customs officer William Robert Burrell and Edith Jane née Armstrong, at the home of her parents, Denelbie in Bowen Bridge Road, Brisbane, with Presbyterian rites administered by the Rev. Dr Ernest Merrington from Saint Andrew’s. Eileen’s brothers Ross and Moreton Burrell are also on the Saint Andrew’s Honour Boards. Maurice embarked on HMAT Wiltshire A18 in Sydney on 7 February 1917 as part of the 7th reinforcements for the 41st Infantry Battalion. In England he underwent further training and was taken on strength with the 41st in Belgium on 21 August 1917. 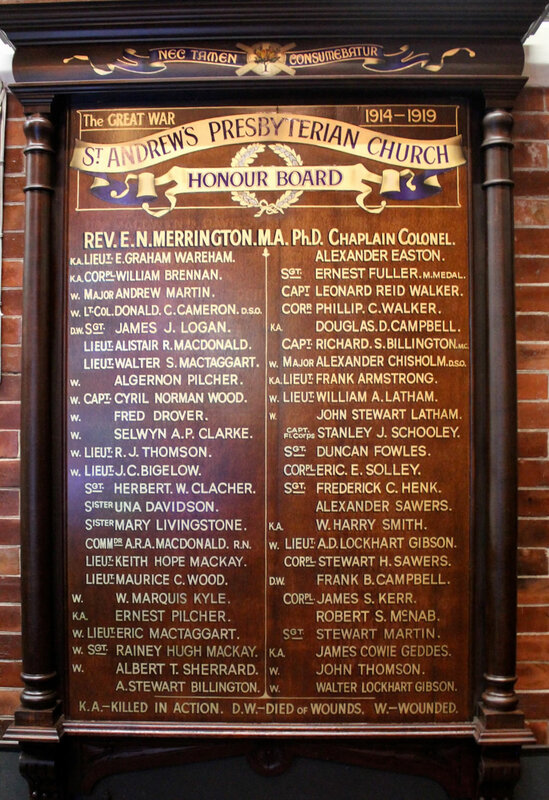 In the 41st was a familiar face from Saint Andrew’s – Lieutenant 'Eric' MacGibbon, who is also listed on the Honour Boards. The 41st was engaged in the Battle of Broodseinde in early October 1917, slogging forward in rain and mud to secure its objective, and repulsing determined counter-attacks. The Battalion then rotated between rear areas and the front line for the rest of 1917 and the early part of 1918. On 22 November 1917 Maurice was promoted to Lieutenant. Like many war veterans he generally avoided speaking to family about his experiences, but one story he did recount was about the randomness of death in war. He had been using his high-quality binoculars to periodically view through a loophole in the trench sandbags, when a Captain demanded that he hand over the binoculars. As the Captain started looking through the loophole with the binoculars an enemy sniper fired - and the Captain fell back dead. When the German army launched a major offensive in March 1918, Maurice’s unit was one of those rushed to the south to halt the advance before the key railway junction of Amiens. In the defensive line they had to endure fierce artillery shelling, and in late May in the line at Villers-Bretonneux the heavy shelling included many mustard gas shells. In early July 1918 the 41st ‘hopped over’ in the successful attack at Hamel (regarded as a credit to General Monash’s integrated planning). The Allies commenced their own major offensive in August 1918 but Maurice was on leave in England at the time of the successful initial attack. He did re-join the 41st on 25 August at Sailly-Laurette and take part in the subsequent rolling back of the German Army to the Hindenburg Line, and then the fighting that breached those defences along the St Quentin Canal in late September and the start of October 1918. Maurice returned to the UK in early March 1919, with leave in June and July being an opportunity to make final visits to various relatives and friends in England and Scotland. He embarked on HMAT Kanowna A61 – aboard which the keen gymnast was made the sports officer - on 28 August 1919. Maurice was a freemason and a group of 27 of them aboard the Kanowna had a farewell dinner as the Kanowna was sailing from Fremantle to Adelaide. He disembarked in Sydney and completed the return to Brisbane by train in late October. In December of that year his appointment was formally terminated, although he was appointed as a Lieutenant in the Reserve of Officers. Maurice and Eileen lived in Melton Road, Nundah and raised their two daughters (Doris Marion and Edith Hazel) there. On 1 October 1922 Maurice was appointed as prosecutions officer in the Land and Income Tax area of the Queensland Treasury Department, and was in that role until at least 1930. Both Commonwealth and State governments levied land and income taxes, and from 1923 through the 1920s and 1930s these taxes were administered by agreement between the two levels of government (in Queensland and the other Eastern States) by State government officers. In World War 2 the Commonwealth increased income tax and wanted more direct control of its administration, and in 1942 many tax officers were temporarily transferred to Commonwealth control – although as a history of the ATO points out ‘Most would hardly have noticed the difference because they went to the same offices and sat at the same desks doing almost the same work’. The Commonwealth announced in 1946 that it intended to keep control of income tax, and most of the staff elected to move permanently to the Commonwealth public service. Maurice retired in 1956 – his last position being Assistant Deputy Commissioner (Administration) in the State Headquarters of the ATO – and was farewelled at a dinner hosted by the Deputy Commissioner in the United Service Club. In retirement Maurice and Eileen enjoyed driving trips in Queensland and NSW, with Maurice welcoming the photography opportunities this presented. He also relished time with his grandchildren and woodwork in his workshop. Maurice was in the War Veterans Home in Caboolture in the second half of the 1970s, and died at the age of 87 on 21 January 1980 in the Kenmore Repatriation Hospital. His ashes were interred, with Presbyterian rites, in the Albany Creek Memorial Park. Eileen had predeceased him (in 1969) and her ashes are also interred at Albany Creek. • Queensland State Archives, Digital Image ID 26704, ID 26705. • National Archives of Australia – service records? • MacGibbon, FW, The Forty First, Australian Commonwealth Military Forces 1919. • Scott, Ernest, ‘Australia During the War’ volume xi of Official History of Australia in the War of 1914-18, Angus and Robertson, Sydney, 1936, pp94-97. • Wilson, LC, and Wetherall, H, History of the 5th Light Horse Regiment (Australian Imperial Force), A. Green, Brisbane, 2008. • Telegraph (Brisbane) 15 April 1915, p10. The assistance of family with information and photos is gratefully acknowledged.